Many people from different cultures believe that parenting is the preserve of moms. As a result it’s generally accepted that dad goes to work while mummy stays behind to take care of home affairs. These societal beliefs should be questioned for the benefit of the child in the family. What if these traditional gender roles were reversed? After all, these roles are not cast on stone. Moreover, parenting is a fulltime on-the-job training. This means that the roles can actually be swapped. Think about it, stay at home dad and a working mom. What is the overall effect on your child’s growth and wellbeing? To answer this question, it’s good to examine the qualities you would want to cultivate in your child from a tender age. The main qualities that cut across different cultures and societies include: discipline, courage, tolerance, hardworking, independent decision making and kindness. Others are patience, respect for other people and determination to succeed despite challenges. These are shared values that every parent wants their child to have. So who’s best placed to impart these valuable qualities in your child? 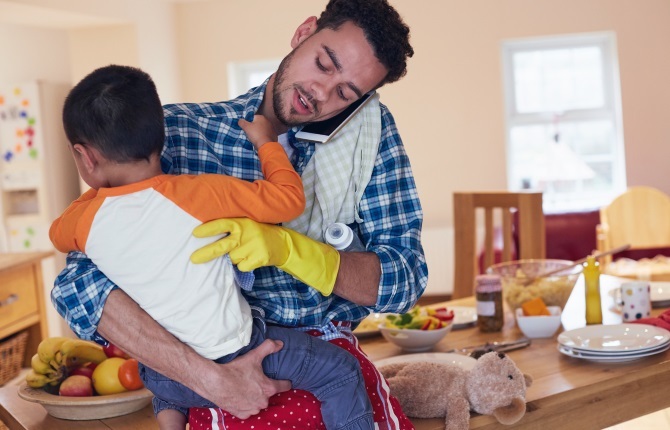 When it comes to parenting, dads and mums have a world of differences in their approach. Mothers have a “softer touch” approach on many issues affecting a child. In most cases they may involve the child in what they are doing. Practically this approach works but the mistakes made in the process will be replicated as the child grows. In addition, it hinders creativity development in the child. Moms approach can generally be viewed as overprotective. This has the effect of pampering the child and killing the spirit of adventure in your child. Dads on the other hand, have an approach that allows a child to develop confidence, enhance creativity and build an adventurer’s spirit. By allowing a child to do things on their own, dads contribute to proper development of the child’s decision making skills and independence. Dad’s style seem to be down to earth. Though a bit stiff approach, it prepares the child to face the real life world. A child grows learning how to handle challenges independently when brought up by a dad. Most (not all) dads do not use a pampering approach in parenting. This makes fathers strict disciplinarians. A child who grows into a self-disciplined adult can lead a successful life anywhere on the planet. Closely tied to discipline is respect. A child who respects oneself, parents, friends and other people can build strong long lasting relationships. They also strike peaceful coexistence with people from different cultures. Most men are known to portray a positive attitude even in the face of danger. This is necessary in cultivating courage and hope in children. Dad is therefore good at building the quality of courage in your child. Men are also good at better control of their emotions. This emotional stability shields a child from mental disturbance in a crisis. In this regard dads score high making them better at parenting. In matters security of the family, dads are naturally the best. The feeling of living in a secure environment gives your child a sense of belonging and love. This contributes to a child’s overall performance in every aspect of child development. This doesn’t mean that these skills will be absent in a child raised by a stay at home mom. It’s only that they maybe more developed in the former case. Increasing cases of student unrest in schools is being blamed on poor parenting. Changing of roles can solve this problems. It’s a fact that in an industrial set up, changing of a process can result in a better quality product; changing parenting is also good. Dads can be very good at parenting. There are cases where fathers have really excelled in raising children alone after the death of their spouses. This points to the fact that dads can indeed stay at home while mom goes to work. The results on child development can be very impressive. Swapping the traditional gender roles could be the key to better societies. It can actually lead to a reduction in crimes, increased productivity and improved child’s academic performance. It’s therefore time the popular beliefs are analyzed critically and objectively. This can lead to overall positive results on your child, family and the society as a whole.